Somehow (and I can't remember how) I recently ended up reading the Wikipedia entry for the K&R style of indentation. K&R just seems so ugly to me – who out there loves it and feels like defending it for my benefit? Indentation styles are such a personal preference, I get that. But K&R just seems to sacrifice so much readability for what? Is it just a case that it's defenders simply can't adjust to anything else? 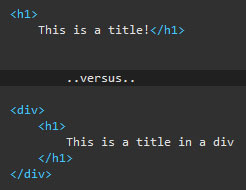 On the subject of indentation styles, I'm wondering a lot about the default HTML formatting built into Visual Studio 2008. When I select the "format" option, certain tags don't tidy up quite as much as I'd like them to. That first h1 tag is just ugly, and there are other tag which seem to be formatted in a similar manner . I remember reading a bit about how to customise the formatting behaviour, but it seems like the sor of thing someone would do and publish as a community download. If anyone could link me to a downloadable set of rules or some sort of guide to making the html formatting slightly saner then I'd be very greatful. Optional extra would be an option button to say 'Take output from a non standards aware source such as Fireworks and fix it up', which would be super.